Think you know the rules of the road for bicycles? Bike advocates confidently told me that most cyclists are aware of their legal obligations while riding. But when I did a story about California's new three-feet law last September, I took the opportunity to ask a bike expert about a couple of other rules. But I'm not alone. Quizzing friends and KPCC colleagues about other rules – bicyclists and non-bicyclists alike — no one walked away with a perfect score. But bicycling will be a major part of Southern California's future. It's a core piece of L.A.'s city infrastructure plan for the next 20 years, and CicLAVia is booming so much that it's branching out with events in the San Fernando Valley and Pasadena. If more cyclists hit the streets, though, is everyone educated enough so the roads can be shared safely? There are no official statistics on how well-informed people are. Diehard bike advocates – as you'd expect – disagree. Yet more than 15,000 accidents statewide involved a bike in 2012, according to the California Highway Patrol. 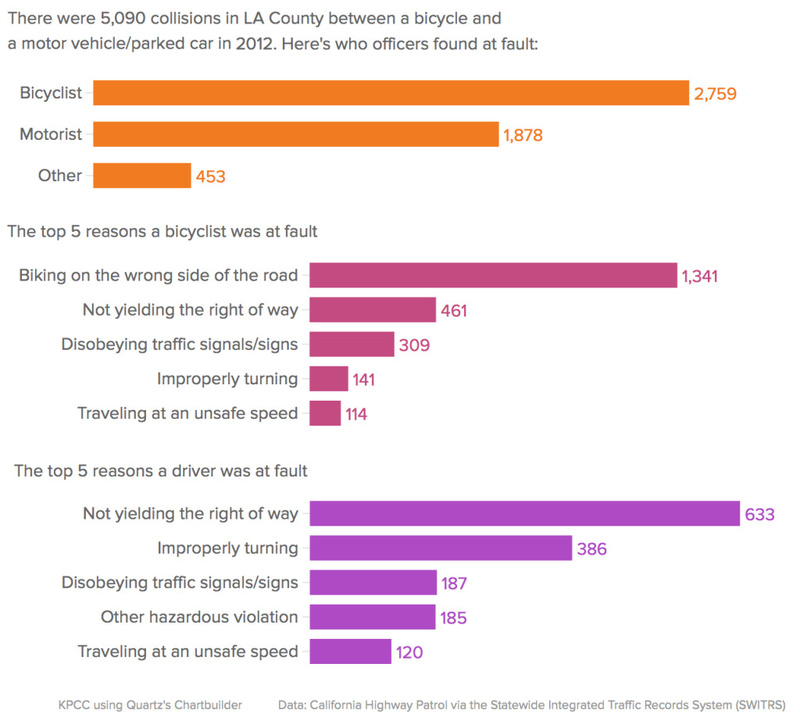 About a third of those collisions happened in L.A. County. The blame for those accidents is about even on the national level, says the League of American Bicyclists. The number one reason why bicyclists cause accidents is because they're riding on the wrong side of the road. Colin Bogart from the L.A. County Bike Coalition has a theory why that happens: It's the way people were once taught. "A lot of people are very frightened about being hit from behind," he says. "I think that's a big reason why a lot of people ride the wrong way in traffic." Meanwhile, the leading cause of accidents caused by drivers is when they turn into the path of a cyclist. At an intersection, for example, a driver might cut off a bicyclist while making a right without yielding – the bike was supposed to have the right of way. Before drivers take to the streets, they have to take a class, pass a test and earn a license. For bicyclists, none of that has to happen. Driver's education doesn't extensively cover what motorists should do around bikes, either. That's where local groups like the L.A. County Bike Coalition step in. Every so often they'll collaborate with the LAPD for Operation Firefly, a project where they'll hand out free lights to passing bicyclists: In California you're legally required to have a front-facing light and a rear reflector. "It's less about, 'Hey, this is what you've got to do to avoid a ticket,'" says Colin Bogart from the LACBC. "It's more about, 'This is what you need to do to make yourself visible when you're riding at night.'" Police officers also take charge of educating motorists when they pull them over for infractions. "That's why we're handing pamphlets out," says Officer Mike Flynn of the LAPD's Central Division, "trying to educate motorists if we see them committing stuff that's unsafe." These moments become on-the-fly education for drivers and cyclists to better prepare everyone to be safe on the road. What about learning the rules after you break them? Throughout the country there are "bike traffic schools" for adults with a citation. Go to a class and your fine will be reduced. Certain places in California tried to do that, too. The problem: It's against the law in this state. "Right now, they can’t, even if they want to," says Dave Snyder of the California Bike Coalition. The way the law reads, adults can only attend a traffic school of any kind to reduce points, not a fine. But, you know, bicyclists don’t get points. A technicality in that law allows college campuses to have them, and Bike East Bay tried to bring its program at UC Berkeley over to the the city of Alameda in 2012. The police chief at the time was bike friendly and developed a work around: Take a class in the 30 days before a citation is processed, and we'll rip up the ticket. But Alameda’s police chief left at the end of that year, and the program went with him. Snyder says the coalition is working to find a sponsor in the legislature to change state law so all police departments are allowed to offer these classes. "It’s the first time we've tried this," he says, "but [cyclists] come out of those classes feeling a lot more confident and a lot more secure." There are plenty of local resources to help you brush up on the laws. The LACBC hold classes for its members, for instance, and Santa Monica Spoke has an online guide. There will be a free class in Studio City on Saturday, March 7th hosted by the city's neighborhood council, too. The California Bike Coalition also has a round-up of state laws that govern bikes. Be aware that certain rules differ from city to city, though. Remember where I said that sidewalk riding is "sort of" legal? It is in Los Angeles, for example, but illegal in Santa Monica. LAPD Officer Mike Flynn offers one simple lesson for cyclists to remember: "Everything that a car does, you do? Then you’re not going to have any issues." That holds true for drivers, too: Treat bicyclists like any other vehicle.